Polish Americans are Americans who have total or partial Polish ancestry. There are an estimated 9.5 million self-identified Polish Americans, representing about 3% of the U.S. population. Polish Americans are the largest Slavic ethnic group in the United States, second largest Central European group and the eighth largest immigrant group overall. The first Polish settlers arrived at Walter Raleigh's failed Roanoke Colony in 1585. In 1608 Polish settlers came to the Virginia Colony as skilled craftsmen. Two early immigrants, Casimir Pulaski and Tadeusz Kościuszko, led armies in the Revolutionary War and are remembered as national heroes. Overall, more than one million Poles and Polish subjects have immigrated to the United States, primarily during the late 19th and early 20th centuries. Exact immigration numbers are unknown. Many immigrants were classified as "Russian", "German" and "Austrian" by the U.S. Immigration and Naturalization Service as the Polish state did not exist from 1795 to 1918 and thus the former territories of Poland at this time were under Prussian, Austrian-Hungarian and Russian control. Complicating the U.S. Census figures further are the high proportion of Polish Americans who marry outside their ethnicity; in 1940, about 50 percent married other American ethnics and a study in 1988 found that 54 percent of Polish Americans three generations or higher had been of mixed ancestry. The Polish American Cultural Center places a figure of Americans who have some Polish ancestry at 19-20 million. From 1870 to 1914, Poles and Polish subjects formed a significant part of the wave of immigration from Germany, Imperial Russia, and Austria Hungary. The Ethnic Poles and Jews in particular came in family groups, settled in and/or blended into largely Polish neighborhoods and other Slavic bastions, and aspired to earn relatively high wages compared to what they could earn back in Europe (thus why many took the ample job opportunities for unskilled manual labor in industry and mining). The main Ethnically-Polish-American organizations were founded because of high Polish interest in the Catholic church, parochial schools, and local community affairs. Relatively few were politically active. Since 1914, the United States has seen mass emigration from Poland, and the coming of age of several generations of fully assimilated Polish Americans. Immigration from Poland has continued into the early 2000s, and began to decline after Poland joined the European Union in 2004. The income levels have gone up from well below average, to above average. Poles became active members of the liberal New Deal Coalition from the 1930s to the 1960s, but since then, many have moved to the suburbs, and have become more conservative and vote less often Democratic. Outside of Republican and Democratic politics, politics such as those of Agudath Israel of America have heavily involved Polish-Jewish Americans. Polish-American grocery, 1922, Detroit, Michigan. The U.S. Census asked Polish immigrants to specify Polish as their native language beginning in Chicago in 1900, allowing the government to enumerate them as an individual nationality when there was no Polish nation-state. No distinction is made in the American census between ethnically Polish Americans and descendants of non-ethnic Poles, such as Jews or Ukrainians, who were born in the territory of Poland and considered themselves Polish nationals. Therefore, some say, of the 10 million Polish Americans, only a certain portion are of Polish ethnic descent. On the other hand, many ethnic Poles when entering the US from 1795 to 1917, when Poland did not exist, did not identify themselves as ethnic Poles and instead identified themselves as either German, Austrian or Russian (this pertained to the nations occupying Poland from 1795 to 1917). Therefore, the actual number of Americans of at least partial Polish ancestry, could be well over 10 million. In the 2011 United States Census Bureau's Population Estimates, there are between 9,365,239 and 9,530,571 Americans of Polish descent, with over 500,000 being foreign-born. The vast majority of Polish immigrants settled in metropolitan areas, attracted by jobs in industry. The minority, by some estimates, only ten percent, settled in rural areas. The Gateway Theatre, seat of the Copernicus Foundation, in Jefferson Park, Chicago. The Baroque spire is modeled on the Royal Castle, Warsaw. One of the most notable in size of the urban Polish American communities is in Chicago and its surrounding suburbs. The Almanac of American Politics 2004 states that "Even today, in Archer Heights (a neighborhood of Chicago), you can scarcely go a block without hearing someone speaking Polish." Chicago bills itself as the largest Polish city outside of Poland, with approximately 185,000 Polish language speakers, making Polish the third most spoken language in Chicago. The influence of Chicago's Polish community is demonstrated by the numerous Polish-American organizations: the Polish Museum of America, Polish Roman Catholic Union of America (the oldest Polish American fraternal organization in the United States), Polish American Association, Polish American Congress, Polish National Alliance, Polish Falcons and the Polish Highlanders Alliance of North America. In addition, Illinois has more than one million people that are of Polish descent, the third largest ethnic group after the German and Irish Americans. Chicago's Polish community is concentrated along the city's Northwest and Southwest Sides, along Milwaukee and Archer Avenues, respectively. Chicago's Taste of Polonia festival is celebrated at the Copernicus Foundation, in Jefferson Park, every Labor Day weekend. Nearly 3 million people of Polish descent live in the area between Chicago and Detroit, including Northern Indiana, a part of the Chicago metropolitan area. The community has played a role as a staunch supporter of the Democratic machine, and has been rewarded with several congressional seats. The leading representative has been Congressman Dan Rostenkowski, one of the most powerful members of Congress (1959 to 1995), especially on issues of taxation, before he went to prison. Greenpoint, Brooklyn, considered the center of New York City's Little Poland. The New York City Metropolitan Area, including the borough of Brooklyn in New York City as well as Northern New Jersey, is home to the second largest community of Polish Americans and is now closely behind the Chicago area's Polish population. Greenpoint, New York in Brooklyn is home to the Little Poland of New York City, while Williamsburg, Maspeth and Ridgewood also contain vibrant Polish communities. In 2014, the New York metropolitan area surpassed Chicago as the metropolitan area attracting the most new legal immigrants to the United States from Poland. Linden, New Jersey in Union County, near Newark Liberty International Airport, has become heavily first-generation Polish in recent years[when?]. 15.6% of the residents five years old and above in the city of Linden primarily speak the Polish language at home and a variety of Polish-speaking establishments may be found by the Linden station, which is a direct line to Manhattan. St. Theresa's Roman Catholic Church offers Polish-language Mass. In Hudson County, New Jersey, Bayonne houses New Jersey's largest Polish American community, while Wallington in Bergen County, New Jersey contains the state's highest percentage of Polish Americans and one of the highest percentages in the United States, at over 40%. However, within New Jersey, Polish populations are additionally increasing rapidly in Clifton, Passaic County as well as in Garfield, Bergen County. Riverhead, New York, located on eastern Long Island, contains a neighborhood known as Polish Town, where many Polish immigrants have continued to settle since the World War II era; the town has Polish architecture, stores, and St. Isidore's R.C. Church, and Polish Town hosts an annual summer Polish Fair. LOT Polish Airlines provides non-stop flight service between JFK International Airport in the Queens borough of New York City, Newark and Warsaw. Kosciuszko Foundation is based in New York. Milwaukee's Polish population has always been overshadowed by the city's more numerous German American inhabitants. Nevertheless, the city's once numerous Polish community built a number of Polish Cathedrals, among them the magnificent Basilica of St. Josaphat and St. Stanislaus Catholic Church. Many Polish residents and businesses are still located in the Lincoln Village neighborhood. The city is also home to Polish Fest, the largest Polish festival in the United States, where Polish Americans from all over Wisconsin and nearby Chicago, come to celebrate Polish Culture, through music, food and entertainment. Michigan's Polish population of more than 850,000 is the third-largest among US states, behind that of New York and Illinois. Polish Americans make up 8.6% of Michigan's total population. The city of Detroit has a very large Polish community, which historically settled in Poletown and Hamtramck on the east side of Detroit, the neighborhoods along Michigan Avenue from 23rd street into east Dearborn, the west side of Delray, parts of Warrendale and several sections of Wyandotte downriver. The northern part of Poletown was cleared of residents, to make way for the General Motors Detroit/Hamtramck Assembly plant. Today it contains some of the most opulent Polish churches in America like St. Stanislaus, Sweetest Heart of Mary, St. Albertus, St. Josephat and St. Hyacinthe. Michigan as a state has Polish populations throughout. In addition to metropolitan Detroit, Grand Rapids, Bay City, Alpena and the surrounding area, the thumb of Michigan, Manistee, and numerous places in northern lower Michigan also have sizable Polish populations. The Polish influence is still felt throughout the entire metropolitan Detroit area, especially the suburb of Wyandotte, which is slowly emerging as the major center of Polish American activities in the state. An increase in new immigration from Poland is helping to bolster the parish community of Our Lady of Mount Carmel and a host of Polish American civic organizations, located within the city of Wyandotte. Also, the Detroit suburb of Troy is home to the American Polish Cultural Center, where the National Polish-American Sports Hall of Fame has over 200 artifacts on display from over 100 inductees, including Stan Musial and Mike Krzyzewski. St. Mary's Preparatory, a high school in Orchard Lake with historically Polish roots, sponsors a popular annual Polish County Fair that bills itself as "America's Largest High School Fair." Polish and Polish themed items booth at the Lagrange Street Polish Festival in Toledo, Ohio. Ohio is home to more than 440,000 people of Polish descent, their presence felt most strongly in the Greater Cleveland area, where half of Ohio's Polish population resides. The city of Cleveland, Ohio has a large Polish community, especially in historic Slavic Village, as part of its Warszawa Section. Poles from this part of Cleveland migrated to the suburbs, such as Garfield Heights, Parma and Seven Hills. Parma has even recently been designated a Polish Village commercial district. Farther out, other members of Cleveland's Polish community live in Brecksville, Independence and Broadview Heights. Many of these Poles return to their Polish roots, by attending masses at St. Stanislaus Church, on East 65th Street and Baxter Avenue. Poles in Cleveland celebrate the annual Harvest Festival, which is usually held at the end of August. It features polka music, Polish food and all things Polish. Cleveland's other Polish section is in Tremont, located on Cleveland's west side. The home parishes are St. John Cantius and St. John Kanty. They also host Polish celebratory events in Cleveland. Poles, in Cleveland, were instrumental in forming the Third Federal Savings and Loan, in 1938. After seeing fellow Poles discriminated against by Cleveland's banks, Ben Stefanski formed Third Federal. Today the Stefanski family still controls the bank. Unlike Cleveland's KeyBank and National City Corp., which have their headquarters in Downtown Cleveland, Third Federal is on Broadway Avenue in the Slavic Village neighborhood. Third Federal Savings and Loan is in the top 25 saving and loan institutions in the United States. In 2003, they acquired a Florida banking company and have branches in Florida and Ohio. Panna Maria, Texas was founded by Upper Silesian settlers on Christmas Eve in 1854. Some people still speak Texas Silesian. The Silesian language is a dialect of Polish. Cestohowa, Kosciusko, Falls City, Polonia, New Waverly, Brenham, Marlin, Bremond, Anderson, Bryan, and Chappell Hill were either founded or populated by the Poles. Other industrial cities, with major Polish communities, include: Buffalo, New York; Boston; Baltimore; New Britain, Connecticut; Dallas, Houston, Portland, Oregon; Minneapolis; Philadelphia; Columbus, Ohio; Erie, Pennsylvania; Rochester, New York; Syracuse, New York; Los Angeles; San Francisco; Seattle; Pittsburgh; central/western Massachusetts; and Duluth, Minnesota. Luzerne County, in northeastern Pennsylvania, is the only county in the United States, where a plurality of residents state their ancestry as Polish. 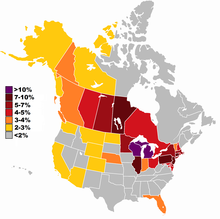 (See: Maps of American ancestries) This includes the cities of Wilkes-Barre, Pittston, Hazelton, and Nanticoke. Many of the immigrants were drawn to this area, because of the mining of Anthracite coal in the region. Polish influences are still common today, in the form of church bazaars, polka music, and Polish cuisine. It is widely believed that Boothwyn, Pennsylvania, has one of the fastest growing Polish communities in the United States. Distribution of Polish Americans, according to the 2000 United States Census. Interior of St Mary of the Angels Catholic Church in Chicago. As in Poland, the majority of Polish immigrants are Roman Catholic. Historically, less than 5% of Americans who identified as Polish would state any other religion but Roman Catholic. Jewish immigrants from Poland, largely without exception, self identified as "Jewish" or "Russian Jewish" when inside the United States, and faced a historical trajectory far different from that of the ethnic Poles. Anusim from Poland also varied in their self-identification, but were more likely to identify as "Polish" in the United States. Polish Americans built dozens of Polish Cathedrals in the Great Lakes and New England regions and in the Mid-Atlantic States. Chicago's Poles founded the following churches: St. Stanislaus Kostka, Holy Trinity, St. John Cantius, Holy Innocents, St. Helen, St. Fidelis, St. Mary of the Angels, St. Hedwig, St. Josaphat, St. Francis of Assisi (Humboldt Park), St. Hyacinth Basilica, St. Wenceslaus, Immaculate Heart of Mary, St. Stanislaus B&M, St. James (Cragin), St. Ladislaus, St. Constance, St. Mary of Perpetual Help, St. Barbara, SS. Peter & Paul, St. Joseph (Back of the Yards), Five Holy Martyrs, St. Pancratius, St. Bruno, St. Camillus, St. Michael (South Chicago), Immaculate Conception (South Chicago), St. Mary Magdalene, St. Bronislava, St. Thecla, St. Florian, St. Mary of Częstochowa (Cicero), St. Simeon (Bellwood), St. Blase (Summit), St. Glowienke (Downers Grove), St. John the Fisherman (Lisle), St. Isidore the Farmer (Blue Island), St. Andrew the Apostle (Calumet City) and St. John the Baptist (Harvey), as well as St. Mary of Nazareth Hospital, on the Near West Side. Poles established approximately 50 Roman Catholic parishes in Minnesota. Among them: St. Wojciech (Adalbert) and St. Kazimierz (Casimir) in St. Paul; Holy Cross, St. Philip, St. Hedwig (Jadwiga Slaska) and All Saints, in Minneapolis; Our Lady Star of the Sea and St. Casimir's in Duluth; and St. Kazimierz (Casimir) and St. Stanislaw Kostka in Winona. A few of the parishes of particular note, founded by Poles elsewhere in Minnesota, include: St. John Cantius in Wilno; St. Jozef (Joseph) in Browerville; St. John the Baptist in Virginia; St. Mary in Częstochowa; St. Wojciech (Adalbert) in Silver Lake; Our Lady of Mount Carmel in Opole; Our Lady of Lourdes in Little Falls; St. Stanislaus B&M in Sobieski; St. Stanislaus Kostka in Bowlus; St. Hedwig in Holdingford; Sacred Heart in Flensburg; Holy Cross in North Prairie; Holy Cross in Harding; and St. Isadore in Moran Township. Poles in Cleveland established St. Hyacinth's (now closed), Saint Stanislaus Church (1873), Sacred Heart (1888–2010) Immaculate Heart of Mary (1894), St. John Cantius (Westside Poles), St. Barbara (closed), Sts Peter and Paul Church (1927) in Garfield Heights, Saint Therese (1927) Garfield Heights, Marymount Hospital (1948) Garfield Heights, and Saint Monica Church (1952) Garfield Heights. Also, the Polish Community created the Our Lady of Częstochowa Shrine on the campus of Marymount Hospital. Poles in South Bend, Indiana founded four parishes: St. Hedwig Parish (1877), St. Casimir Parish (1898), St. Stanislaus Parish (1907), and St. Adalbert Parish, South Bend (1910). Circa 1897, in Pittsburgh's Polish Hill, Immaculate Heart of Mary, modeled on St. Peter's Basilica in Rome was founded. Polish Americans preserved their longstanding tradition of venerating the Lady of Czestochowa in the United States. Replicas of the painting are common in Polish American churches and parishes, and many churches and parishes are named in her honor. The veneration of the Virgin Mary in Polish parishes is a significant difference between Polish Catholicism and Catholicism; Polish nuns in the Felician Order for instance, took to Marianism as the cornerstone of their spiritual development, and Polish churches in the U.S. were seen as "cult-like" in their veneration of Mary. Religious catechism and writings from convents found that Polish nuns in the Felician Sisters and The Sisters of the Holy Family of Nazareth were taught to have "a sound appreciation of Mary's role in the mystery of the Redemption and ...a filial confidence in her patronage," more explicitly, to be "a true daughter to the immaculate Virgin Mary". The Marianism that was taught in Polish parish schools in the United States was done independent of the Catholic Church, and demonstrated autonomy on the part of the nuns who taught Polish American youths. It is notable that there was a concurrent movement in Poland that eventually led to a separatist Catholic church, the Mariavite Church, which greatly expanded the veneration of the Virgin Mary in its doctrine. In Poland, the Virgin Mary was believed to serve as a mother of mercy and salvation for Catholics, and throughout the Middle Ages, Polish knights prayed to her before battle. Polish American churches featured replicas of the Lady of Częstochowa, which was on feature at the Jasna Góra Monastery and holds national and religious significance because of its connection to a victorious military defense in 1655. Several towns in America are named Częstochowa, in commemoration of the town in Poland. Though the majority of Polish Americans remained loyal to the Catholic Church, a breakaway Catholic church was founded in 1897 in Scranton, Pennsylvania. Polish parishioners founded the church to assert independence from the Catholic Church in America. The split was in rebellion from the church leadership, then dominated by Irish bishops and priests, and lacking in Polish language speakers and Polish church leaders. It exists today with 25,000 parishioners and remains independent from the authority of the Roman Catholic Church. Poland is also home to followers of Protestantism and the Eastern Orthodox Church. Small groups of both of these groups also immigrated to the United States. One of the most celebrated painters of religious icons in North America today is a Polish American Eastern Orthodox priest, Fr. Theodore Jurewicz, who singlehandedly painted New Gračanica Monastery in Third Lake, Illinois, over the span of three years. A small group of Lipka Tatars, originating from the Białystok region, helped co-found the first Muslim organization in Brooklyn, New York, in 1907 and later, a mosque, which is still in use. The Polish community was long the subject of anti-Polish sentiment in America. The word, Polack, has become a racial slur. This prejudice was partially associated with anti-Catholicism, and early 20th century worries about being overrun by Central European immigrants. Among the most notable Polish American media groups are: the Hippocrene Books (founded by Polish American George Blagowidow); TVP Polonia; Polsat 2 International; TVN International; Polvision; TV4U New York; WPNA Radio Chicago; Polish Radio External Service (formerly Radio Polonia); Polonia Today and the Warsaw Voice. There are also Polish American newspapers and magazines, such as the Dziennik Związkowy, PL magazine, Polish Weekly Chicago, the Super Express USA and Nowy Dziennik in New York and Tygodnik Polski and The Polish Times in Detroit, not to mention the Ohio University Press Series in Polish American Studies, Przeglad Polski Online, Polish American Journal, the Polish News Online,Am-Pol Eagle Newspaper, and Progress for Poland, among others. During the 1950s–1970s, the Polish wedding was often an all-day event. Traditional Polish weddings in Chicago metropolitan area, in areas such as the southeast side of Chicago, inner suburbs like Calumet City and Hegewisch, and Northwest Indiana suburbs, such as Whiting, Hammond and East Chicago, always occurred on Saturdays. The receptions were typically held in a large hall, such as a VFW Hall. A polka band of drums, a singer, accordion, and trumpet, entertained the people, as they danced traditional dances, such as the oberek, "Polish Hop" and the waltz. Always an important part of Slavic culture, food played a very important role. The musicians, as well as the guests, were expected to enjoy ample amounts of both food and drink. Foods, such as Polish sausage, sauerkraut, pierogi and kluski were common. Common drinks were beer, screwdrivers and highballs. Many popular Polish foods became a fixture in the American cuisine of today, including kiełbasa (Polish sausage), babka cake, kaszanka (kasanzka) and pierogi. Polish American cultural groups include Polish American Arts Association and the Polish Falcons. Among the many Polish American writers are a number of poets, such as Phil Boiarski, Hedwig Gorski, John Guzlowski, John Minczeski, Linda Nemec Foster, Leonard Kress (poet and translator), Cecilia Woloch, Kim Kikel and Mark Pawlak (poet and editor), along with novelists Leslie Pietrzyk, Thad Rutkowski, Suzanne Strempek Shea and others. The Polish Museum of America in Chicago. Among the best known Polish American museums are the Polish Museum of America in Chicago's old Polish Downtown; founded in 1935, the largest ethnic museum in the U.S. sponsored by the Polish Roman Catholic Union of America. The Museum Library ranks as one of the best, outside of Poland. Equally ambitious is the Polish American Museum located in Port Washington, New York, founded in 1977. It features displays of folk art, costumes, historical artifacts and paintings, as well as bilingual research library with particular focus on achievements of the people of Polish heritage in America. There is also the Polish Cultural Institute and Museum of Winona, Minnesota, known informally as "The Polish Museum of Winona." Formally established in 1979 by Father Paul Breza, the Polish Museum of Winona features exhibits pertaining to Winona's Kashubian Polish culture and hosts a wide range of events celebrating America's Polish-American heritage in general. There are a number of unique festivals, street parties and parades held by the Polish American community. The Polish Fest in Milwaukee, Wisconsin, which is a popular annual festival, takes place at the Henry Maier Festival Park. It is also the largest Polish festival in the United States. It attracts Polish Americans from all over Wisconsin and nearby Chicago, who come to celebrate Polish culture through music, food and entertainment. New York City is home to the New York Polish Film Festival, an annual film festival showcasing current and past films of Polish cinema. NYPFF is the only annual presentation of Polish films in New York City and the largest festival promoting and presenting Polish films on the East Coast. The Polish Festival in Syracuse's Clinton Square has become the largest cultural event in the history of the Polish community in Central New York. There's also the Taste of Polonia festival held in Chicago every Labor Day weekend since 1979 at the Copernicus Cultural and Civic Center in the Jefferson Park area. The Polish Festival in Portland, Oregon is reported to be the largest in the Western United States. One of the newest and most ambitious festivals is the Seattle Polish Film Festival organized in conjunction with the Polish Film Festival in Gdynia, Poland. Kansas City, Kansas is home to a large Polish population and for the last 31 years, All Saints Parish has hosted Polski Day . And last, but not least, there's the Pierogi Fest in Whiting, Indiana with many more attractions other than Polish pierogi, and the Wisconsin Dells Polish Fest. Polish-Americans have influenced American culture in many ways. Most prominent among these is that Jefferson drafting the Constitution of the United States was inspired by religious tolerance of the Warsaw Confederation, which guaranteed freedom of conscience. The Polish culture left also culinary marks in the USA - the inclusion of traditional Polish cuisine such as pierogi, kielbasa, golabki. Some of these Polish foods were tweaked and reinvented in the new American environment such as Chicago's Maxwell Street Polish Sausage. Polish Americans have also contributed to altering the physical landscape of the cities they have inhabited, erecting monuments to Polish-American heroes such as Kościuszko and Pulaski. Distinctive cultural phenomena such as Polish flats or the Polish Cathedral style of architecture became part and parcel of the areas where Polish settlement occurred. Early Polish immigrants built houses with high-pitched roofs in the United States. The high pitched roof is necessary in a country subject to snow, and is a common feature in Northern and Eastern European architecture. In Panna Maria, Texas, Poles built brick houses with thick walls and high-pitched roofs. Meteorological and soil data show that region in Texas is subject to less than 1 inch of snow and a meteorological study conducted 1960-1990 found the lowest one-day temperature ever recorded was 5 degrees Fahrenheit on January 21, 1986, highly unlikely to support much snow. The shaded veranda that was created by these roofs was a popular living space for the Polish Texans, who spent much of their time there to escape the sub-tropical temperatures of Texas. The Poles in Texas added porches to these verandas, often in the southward windy side, which is an alteration to traditional folk architecture. According to oral histories recorded from descendants, the verandas were used for "almost all daily activities from preparing meals to dressing animal hides." The Poles in Texas put straw thatching on their roofs until the early 1900s, another European influence. The first house built by a Pole in Panna Maria is the John Gawlik House, constructed 1858. The building still stands and is visited as a historical attraction in the cultural history of Texas. In 2011, the San Antonio Conservation Society financed a replacement of the building's roof, identifying it as a "historically and architecturally significant building". Organizations like the Polish Legion of American Veterans were organized to memorialize the Polish contribution to the American military. For a more comprehensive list, see List of Polish Americans. ^ a b "Total ancestry categories tallied for people with one or more ancestry categories reported 2010 American Community Survey 1-Year Estimates". United States Census Bureau. Retrieved 2 November 2015. ^ U.S. Census Bureau. "Ancestry: 2000" (PDF). Archived from the original (PDF) on 20 September 2004. Retrieved 25 April 2014. ^ "Alliance News : 2008" (PDF). Polishtoledo.com. Retrieved 28 August 2017. ^ "Waclaw Kruszka, Historya Polska w Ameryce, Milwaukee 1905, p. 65 (in Polish)" (PDF). The Polish-American Liturgical Center. Retrieved 2 November 2015. ^ "About the Population Census". Flps.newberry.org. Retrieved 17 March 2015. ^ a b c d Data Access and Dissemination Systems (DADS). "American FactFinder - Results". Factfinder.census.gov. Retrieved 29 December 2018. ^ Data Access and Dissemination Systems (DADS). "American FactFinder - Search". Archived from the original on 29 December 2018. Retrieved 29 December 2018. ^ "Yearbook of Immigration Statistics: 2011 Supplemental Table 2". U.S. Department of Homeland Security. Retrieved 2012-11-02. ^ "Supplemental Table 2. Persons Obtaining Lawful Permanent Resident Status by Leading Core Based Statistical Areas (CBSAs) of Residence and Region and Country of Birth: Fiscal Year 2014". U.S. Department of Homeland Security. Retrieved September 11, 2016. ^ "Yearbook of Immigration Statistics: 2013 Supplemental Table 2". U.S. Department of Homeland Security. Retrieved September 11, 2016. ^ "Yearbook of Immigration Statistics: 2012 Supplemental Table 2". U.S. Department of Homeland Security. Archived from the original on December 22, 2014. Retrieved September 11, 2016. ^ "POLISH AIRLINES LOT". LOT POLISH AIRLINES. Retrieved 2012-11-17. ^ Gauper, Beth (2007-05-27). "Polish for a day". MidwestWeekends.com. St. Paul Pioneer Press. Retrieved 2008-01-11. ^ "Polish Village In Parma Ohio". Facebook.com. Retrieved 28 August 2017. ^ "The Cleveland Society of Poles | Polish Foundation | Cleveland Ohio". Clevelandsociety.com. Retrieved 2012-09-10. ^ See "Jewish Surnames (Supposedly) Explained" in regards to name changes, self-identification, &c. as pertaining to Jewish and other immigrants at Ellis Island. ^ "Project MUSE - A Social History of Polish-American Catholicism". Muse.jhu.edu. Retrieved 17 March 2015. ^ Contrary to popular understanding, Anusim were not just Sephardim. The Jewish Virtual Library explains this well. Julian Czerniecki identified as "Lithuanian" on his immigration manifest at Ellis Island and Russian Polish during the 1910 and 1920 Census Enumerations. ^ "Our Lady of Czestochowa Shrine". Marymount Hospital. Retrieved 14 October 2010. ^ No Author Listed. "A History of Polish Hill and the PHCA". Retrieved 2006-12-22. ^ "Serbian Monastery of New Gracanica – History". Newgracanica.com. Archived from the original on 21 February 2009. Retrieved 28 August 2017. ^ "Religion: Ramadan". Time. 1937-11-15. Retrieved 2010-05-22. ^ "PL - polsko-amerykański dwujęzyczny miesięcznik / Polish-American bilingual monthly". Plmagazine.net. Archived from the original on 2012-10-13. Retrieved 2012-09-10. ^ "Ohio University Press & Swallow Press". Ohioswallow.com. Retrieved 2012-09-10. ^ "Welcome to the Polish American Journal". Polamjournal.com. Retrieved 28 August 2017. ^ "Polsko Amerykański portal - Polish American portal". Polishnews.Com. Retrieved 2012-09-10. ^ "The Am-Pol Eagle". Ampoleagle.com. Retrieved 28 August 2017. ^ "Progress for Poland - Chicago: Fakty, Wiadomości, Opinie..." Progress for Poland. Retrieved 17 March 2015. ^ a b "Polish American Historical Association - Resources and Supported Links". Polishamericanstudies.org. Archived from the original on 2017-11-25. Retrieved 28 August 2017. ^ "Święto polskiego kina w Nowym Jorku" (in Polish). Wirtualna Polska. 6 May 2009. Retrieved 12 March 2012. ^ "May 3rd Polish Constitution Day". Ampoleagle.com. Retrieved 17 March 2015. ^ "Intellicast - Panna Maria Historic Weather Averages in Texas (78144)". Intellicast.com. Retrieved 17 March 2015. ^ a b Francis Edward Abernathy (1 August 2000). Publications of the Texas Folklore Society. University of North Texas Press. pp. 132–. ISBN 978-1-57441-092-1. Retrieved 10 April 2013. ^ "mySouTex.com - Grant will replace roof of 1858 Panna Maria house". Mysoutex.com. Archived from the original on 29 June 2013. Retrieved 17 March 2015. ^ "PLAV History". Plav.org. Retrieved 28 August 2017. Bukowczyk, John J. (1996). Polish Americans and Their History: Community, Culture, and Politics. Pittsburgh, Pa: University of Pittsburgh Press. ISBN 0-8229-3953-3. OCLC 494311843. Gladsky, Thomas S. (1992). Princes, Peasants, and Other Polish Selves: Ethnicity in American Literature. Amherst: University of Massachusetts Press. ISBN 0-87023-775-6. OCLC 24912598. Lopata, Helena Znaniecka (1976). Polish Americans: Status Competition in an Ethnic Community. Ethnic groups in American life series. Englewood Cliffs, N.J.: Prentice-Hall. ISBN 0-13-686436-8. OCLC 1959615. Thomas, William Isaac; Znaniecki, Florian Witold (1996) [1918–1920]. The Polish Peasant in Europe and America: A Classic Work in Immigration History. Urbana: University of Illinois Press. ISBN 0-252-06484-4. OCLC 477221814. Chicago Foreign Language Press Survey: English translations of 120,000 pages of newspaper articles from Chicago's foreign language press from 1855 to 1938, many from Polish papers.